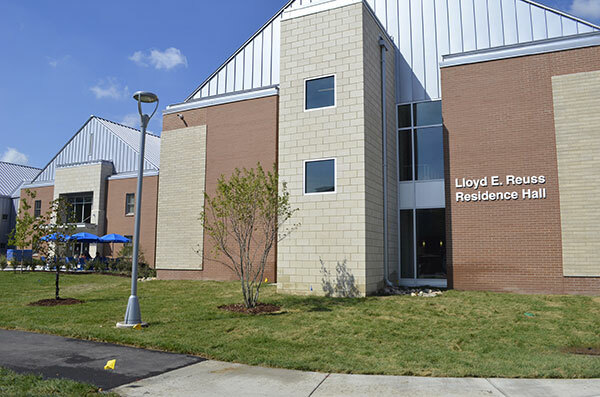 SOUTHFIELD, Mich. – Lawrence Technological University held a dedication ceremony on Sept. 28 for its third residence hall, which has been named in honor of Lloyd Reuss of Bloomfield Hills. The Lloyd E. Reuss Residence Hall is a 47,545-square-foot, two-story building that has five pods with 16 double-occupancy units. The $11.6 million project was completed in time for 150 freshmen to move in prior to the start of classes on Aug. 24. 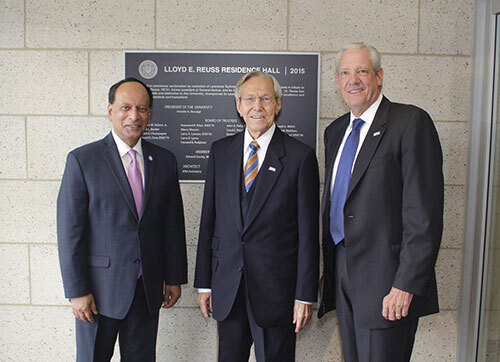 Reuss, who is a former president of General Motors, has been on LTU’s Board of Trustees since 1978 and served as chairman of the board from 1993 until 2014. The opportunity to honor Reuss drew many public officials and civic leaders, including Southfield Mayor Donald Fracassi; Southfield City Council President Sylvia Jordan and several other members of the council; Congresswoman Brenda Lawrence, who served as mayor of Southfield for many years; State Rep. Jeremy Moss; and Oakland County Commissioner Janet Jackson. The completion of the new residence hall is a milestone toward LTU’s long-term goal to build a strong residential community on campus. The two older residence halls have space for 600 students, and Reuss Hall has increased the residential capacity by 25 percent. Because of high demand, LTU also leases residential suites for 60 additional students at Arbor Lofts on nearby Civic Center Drive in Southfield. While LTU was once a commuter college, it now attracts students from 25 states and 60 countries. Increased demand for on-campus housing has been created in part by the expansion of the athletics at LTU, which became a member of the National Association of Intercollegiate Athletics in 2011. More than 300 students participate on 16 varsity teams and three junior varsity teams, and LTU will add five more teams in the next two years. Lawrence Technological University, www.ltu.edu, is a private university founded in 1932 that offers more than 100 programs through the doctoral level in Colleges of Architecture and Design, Arts and Sciences, Engineering, and Management. The Brookings Institution ranks Lawrence Tech fifth nationwide for boosting graduates’ earning power, PayScale lists it in the nation’s top 10 percent of universities for graduates’ salaries, and U.S. News and World Report places it in the top tier of best Midwestern universities. Students benefit from small class sizes and a real-world, hands-on, “theory and practice” education with an emphasis on leadership. Activities on Lawrence Tech’s 102-acre campus in Southfield, Michigan, include over 60 student organizations and NAIA varsity sports.